I love Greek salad. Bursting with beautiful colours, loaded with the goodness of fresh vegetables and tantalizing the taste buds with the lemony dressing! 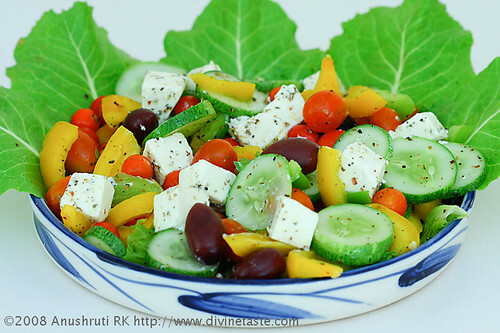 Red from the cherry tomatoes, white from the feta cheese, yellow from the bell peppers, black from the kalamata olives, green from the lettuce and cucumber make a colourful display that appeals to the eye. 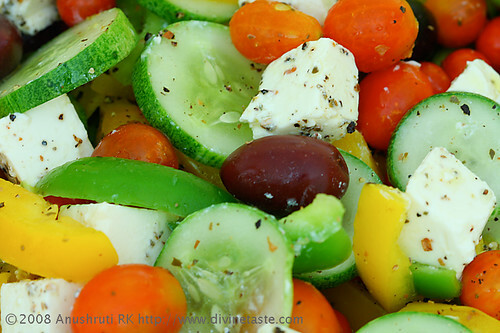 Called horiatiki in Greece and popularly known as Greek salad elsewhere, the flavour and texture of the salad do a good job of appealing to the senses. Many a time, when I’m tired or in the mood for a T.V dinner, Greek salad and some crusty whole meal bread take care of my hunger pangs. It also quite often makes an appearance as a wonderful side or salad when I have planned an elaborate menu. If you carefully construct the salad, arranging it by layers and colours according to your choice, it can form an attractive centerpiece for a buffet lunch or dinner. You can adjust the limejuice in the dressing according to taste. Substitute any black olives, if you can’t find kalamata olives. I also substitute the Indian cheese panir which is quite similar to the salty feta, when I can’t find good quality feta cheese. Mix all the ingredients for the salad dressing in a bowl. Prepare the salad ingredients. After washing the lettuce, keep them immersed in ice water to preserve crispness. 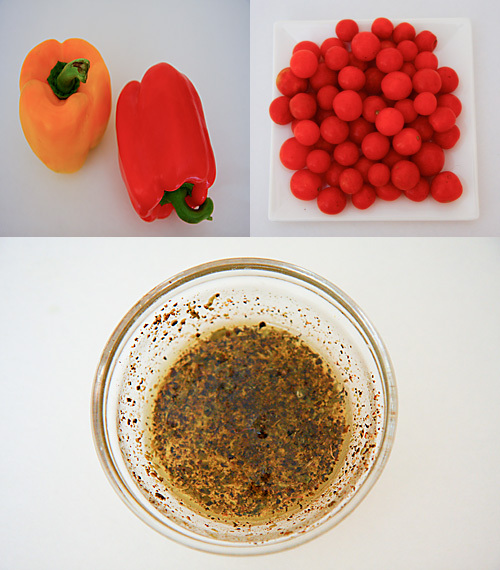 In a large bowl assemble all the ingredients for the salad and dress with the salad dressing. * When I’m in the mood for fewer calories I reduce the oil from 2 tbsp to 1 tbsp. Less of olive oil flavour, but not bad at all! * For a vegan version, replace the feta with any vegan cheese. Wow!! so colorfull! I will try this surely..
Pankaja: Let me know how you liked it. Preethi: I can only imagine how very cute Tanya would look and sound while humming it. Hi Anu, Think Simi made something very similar the other day. Will check if it was Greek salad? Tasted good and keeps the mouth fresh despite gorging other heavier stuff. Nice colourful clips. One of my favourite salads, too. Very yummy and the photo looks fantastic here !! The photography is really very very good . That is the additional asset of your site,and plus this is done by you is appreciable . Great you are. The salad I felt like to grab from the screen. Wish you all the best . Hi! This Salad is now an all time favourite with all of us, not only for its excellent taste but also for its colourful and appetizing look!